Departures Every Saturday from March 14th - October 17th. Click on the days below for more information. Transfer and departure from the tour terminal, travel through La Mancha country to Cordoba. Sightseeing tour, visiting its famous Mosque/Cathedral and Jewish Quarter. Then to Sevilla. 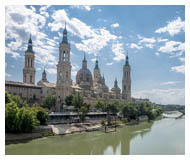 Morning city tour visiting the Park of María Luisa, Plaza de España, outskirts of the great Cathedral and its giralda Tower, and the typical Barrio de Santa Cruz, former Jewish quarter. Afternoon at leisure. Departure to Granada. Sightseeing tour visi- ting the impressive Alhambra, a world heritage site, with its beautiful Nazari Palaces and the Generalife gardens. Optional visit to the caves of Sacromonte and attend a typical show of gipsy flamenco. Departure via Guadix, Baza and Puerto Lumbreras towards the Mediterranean coast and Valencia. At mid morning departure to Barcelona. Arrival and accommodations. Morning city sightseeing tour visiting the Park of Montjuic with spectacular views, Olympic Ring, monument to Columbus and the old Gothic Quarter. Afternoon at leisure. Optional night tour through the wide avenues and lighted buildings and fountains. Departure to Zaragoza. Short stop. Continuation to San Sebastian. Departure to Bilbao. Short panoramic tour to admire the Guggenheim Museum building. Continuation to Santander. Free time. In the afternoon departure to Santillana del Mar, medieval village considered as a National Monument. Short stop and continue to Torrelavega. Departure through Picos de Europa mountains through splendid landscapes. Arrival to Covadonga with free time to visit the Shrine and continuation to Oviedo. Departure to Gijón the second capital of the region of Asturias. Short panoramic tour and continuation to Luarca, Ribadeo and Lugo in the Region of Galicia. Departure to La Coruña. Short panoramic tour. In the afternoon optional excursion to the Rías Altas through typical villages as Pontedeume, Betanzos, etc. Departure to Santiago de Compostela. City tour of this legendary pilgrimage town, Plaza del Obradoiro, Cathedral, etc. Afternoon at leisure. Departure for the area of the Spanish Fjords (Rias Bajas), through splendid landscapes: La Toja Island, ría de Arosa and Pontevedra. Optional excursion to Santa Tecla and Valença do Miño across the Portuguese border. Continuation to Vigo. Departure to Salamanca. Short stop to know its famous Plaza Mayor and old quarters. Continuation to Madrid.